Programs are easy to find because they are exactly where you left them. It's always confusing in the regular menu when you install or remove some programs and some or all of your other programs change their positions. That's why it was difficult for you to find your programs. Vista Start Menu keeps the positions of programs the same and leaves empty space in the menu when you un-install a program. But not to worry a new program will occupy this space in time. If your vision is poor, or if you set a very large or very small screen resolution, and you want to continue working with comfort, you can simply zoom the screen in or out. Zooming can be adjusted independently of the system settings with the help of the Ctrl+"+" and Ctrl+"-" keys on the keyboard, or on the screen. You can place the menu in a convenient part of the screen or even on another monitor or TV. The program will automatically select the optimal size for the Monitor's window. We have extended the workspace by adding tabs to it. Now, each menu item can contain any number of tabs, which allows you to arrange your information in a comfortable and convenient way for YOU. The free version has tabs with the Quick Launch bar as well as the Startup list. All programs installed last week will be highlighted in a different color in the menu. This will help you quickly find new documents or programs and since they will never change their positions, you will always know where you can find them the next time that you need them. In the past, you had to press the arrow keys and other keys several times until you reached the item you needed. Now you can start any program with just a couple of keystrokes. The program splits the list into sections. You select the necessary section with the first key (for example, by pressing E) and then select the item in the section by pressing one of the keys 1 to 9. Note that the positions of the programs do not change and thus you can memorize these key combinations and use them every day. You no longer have to start your browser just to visit a search engine. Just press the Windows key on the keyboard, type the term you need, press Ctrl+Enter and get the search results. It's so simple! 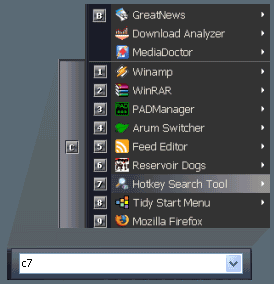 It is also possible to start searching the local computer right from the command line of the Start menu. We are also planning to add other known engines for searching the local computer. This program completely replaces the menu without modifying system files or settings. To revert back to the old menu, just uninstall the program. Also, you can disable integration and start Vista Start Menu by using the Quick Launch bar or the system tray, if you prefer that method. Enable the unique feature called "one-click launch" and customize the menu the way you like it by getting the PRO version.